Maria Sharapova and Angelique Kerber played a very interesting semifinal at the Stuttgart Premier Event earlier today. Sharapova won, 6-3, 2-6, 7-5. I thought it would be an interesting chance to test out the Key Points Analysis, which I debuted earlier this week for the Monte Carlo final. As a reminder, here is the methodology I used: I logged every single Game Point and Break Point (of course, also logging if they were Set Points or Match Points), noting who was serving, who won the point, and what the outcome was, among other things. – There were 50 Key Points played during this semifinal. 33 were on Kerber’s serve, and 17 on Sharapova’s serve. – Maria Sharapova won 28 Key Points, with Kerber winning the remaining 22. – 56% of all the Key Points were won on Point-Ending Shots (either a Winner, an Ace, a Service Winner or a Forced Error). Which is a pretty good number. – 64% of the 22 Key Points during the deciding third set (which Sharapova won 7-5 after serving for it at 5-4) were won on Point-Ending Shots. 12 of those 22 Key Points were won on clean winners, which is truly remarkable, given that deciding sets are often nervy affairs. – 8 of those 12 clean winners came off Maria Sharapova’s racquet. – From 3-5, AD-Kerber in the first set, on Kerber’s serve, until 0-1, 40-15 on Kerber’s serve in the second set, Maria Sharapova won 8 straight Key Points. 5 of those were Kerber Unforced Errors, 2 of which were double-faults. – From 1-5, 40-15 on Sharapova’s serve in the second set, the ladies combined to hand over the next 6 Key Points via unforced errors. Two of those were double-faults. – However, 9 of the next 11 Key Points were won via clean winners. And only one of those was an Ace. 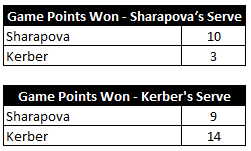 Sharapova won 6 of those points, while Kerber won the remaining 3. That simply means that everyone in that Stutgart arena was having a lot of fun. Yep. Angelique Kerber managed to “win” only 7 Key Points on Maria Sharapova’s serve. And the Sugarpova CEO will be annoyed to see that 86% of those Key Points were donated via unforced errors on her part (two of them were double-faults). Interestingly enough, the only time Kerber won a Key Point through her own means was the last one the German would win: it was at 0-40 on Sharapova’s serve at 5-4 in the third set. – In related news, Angelique Kerber didn’t win a single Key Point on Maria Sharapova’s serve in the entire first set. She had four chances to do so, and she donated half of those via unforced errors. – 5 Key Points were handed over by double-faults. Kerber was responsible for 3 of them. Incidentally, Kerber didn’t commit any additional double-faults during the entire match. Fortunately for Angelique, it was only the first one that cost her dearly: it came on Set Point in the first set. The others came in games where Kerber didn’t get broken (i.e. they occurred at game point). – Maria Sharapova won only 10 Key Points on her own serve. That means she won 18 (almost twice as many) on Kerber’s serve. Only 50% of the 10 Key Points won on her serve were due to Point-Ending Shots, while that number went up to 56% for the Key Points she won on Kerber’s serve. – Maria Sharapova was lethal whenever she had a Game Point on her own serve. That means she converted on said Game Points 77% of the time. That’s very efficient. – Angelique Kerber had to play 10 more Game Points on her serve, and she only converted on 60% of those chances. – 7 of those Game Points on Kerber’s serve came during a monster sixth game in the third set, which saw Kerber waste a 40-0 lead. Sharapova didn’t get a single break point, and Kerber ended up holding serve. What I kept thinking during the match is just how much harder Angelique Kerber has to work in order to hold serve than Sharapova had to during the Russina’s own service games. From the match stats you can see that Kerber had to play 28 more service points than Maria Sharapova throughout the match. That’s a significant difference. It doesn’t bode well for your chances if you have to work so much harder just to hold serve. One of the main culprits is easy to spot: Kerber’s second serve is decidedly below par, and a returner of Sharapova’s caliber will always punish that kind of delivery. The negative trend is amplified when you can’t win many key points on your opponent’s serve. It’s matches like these that make me think that something truly crazy has to happen for Kerber to beat the top females in the WTA and/or get a chance to make a Slam final. She just has to work much harder than those elite players – and her margin for error is significantly smaller. I don’t think all game points are big points. I think only 40-30, or ad-ins are big game points. I never see a fist pump to make the score 40-15, but often see it when the returner gets a game to deuce, ergo not a big point to hold at love or 40-15. And what if a player loses 10 ‘Key’ points in one game, but then eventually wins the game anyway? Does that make including those lost ‘Key’ points irrelevant as far as the overall stats are concerned as they had no bearing on the eventual outcome? Nice stats analysis. I hope you keep doing them. The conclusion though, Kerber has to work harder to win? Yes…every woman on the WTA who isn’t Serena, Masha or Vika has to “work harder” to win vs those girls. You don’t need stats to figure that one out lol.